We all need a place to call home; a proverbial hearth that simultaneous garners sanctuary, familiarity, and inspiration alongside the people we love and cherish. Home is not simply a place, but rather a state of mind and, at times, even of taste, touch, and smell. The fragrance of freshly brewed coffee, frying bacon, and cigarette smoke transcends me to my childhood and the home kitchen of my grandma Dighero as she poetically maneuvers through her standard, grease laden daily breakfast. No matter when: childhood, adolescence, adulthood….I could count on those three intermingled perfumes to make me feel safe, and perpetually hopeful. Dark, brooding, smoky, embellished with sounds of pool balls “clacking” intermittently beneath laughter, “rhubarb rhubarb rhubarb” muttering, and the unmistakable “sizzle” of burgers on a flat top grill. Ahhh, this is home…this is where I come to make business deals, to celebrate the lives of contemporaries, to mourn the loss of important family, to be alone, to be part of a crowd, to break-up, to fall in love, and to, most importantly of all, drink a beer and devour the best cheeseburger on the planet. 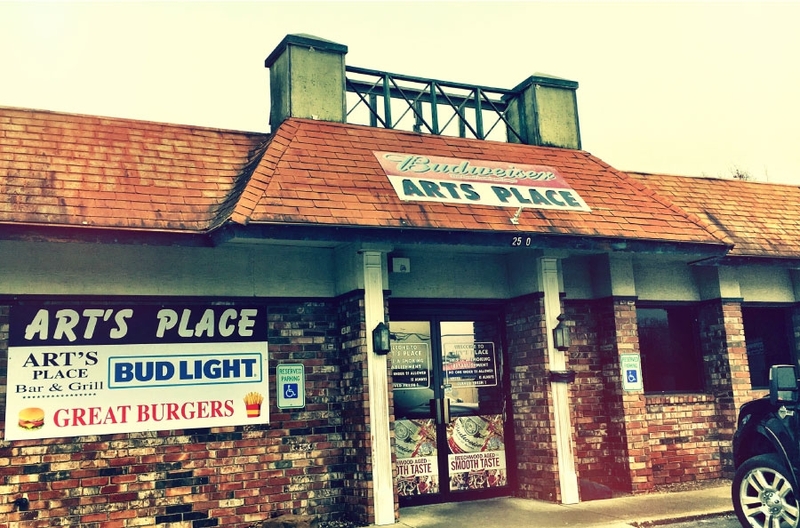 There’s really nothing stylized about the Art’s Place burger; it’s an archetype of perfection, but one should never expect something groundbreaking or cutting edge. 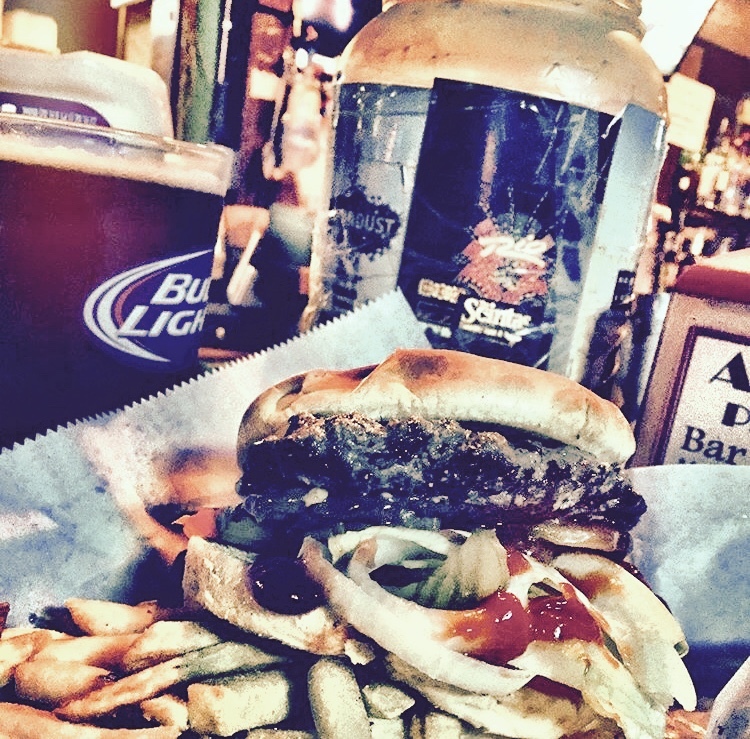 The beef patty is fried in front of you, behind the bar on a flat top grill that has been seasoned with whiskey, bar brawls, and a million lonely hearts, then stratified with mayo, sliced tomato, cold iceberg lettuce, and thick sliced white onions…be sure to ask for extra crispy fries; and don’t be offended if the pretty girl sitting next you at the bar pays you little mind, because she is, well, you’ll just have to see for yourself. Art’s Place is a lot of things to a lot of people, myself included; but at the very least it’s an important part of the edible culture of Fayetteville, Arkansas. It may not be your idea of home, sanctuary, inspiration…but I guarantee it’ll be the best burger you’ve had in a very, long time. I’m HANGRY. Famished after a long, late-morning workout, I point my car in the direction of downtown Springdale, en route to one of my favorite taqueria destinations on Emma Avenue for a regular fix of authentic Mexican grub. It’s cold, the early-spring cold in the Ozarks that fakes us out every year. Following a weekend of balmy mid-70s temperatures, this Monday is suddenly in the lower 30s, an additional factor fanning the flame of my HANGER. I slow down as I approach my destination, but the line is long with freezing patrons dancing in place at the walk-up window; and frankly, it’s too cold, and I’m too hungry to wait. I’m panicky, frustrated as I continue west on Emma ­– and then suddenly I catch sight of a large Arkansas-shaped sign to my left, above large windows showcasing crowded, warm indoor seating. I see people eating. I nearly take out three pedestrians as I quickly, frantically, parallel park on the opposite side of the bustling street. Ah, Springdale, a downtown that is becoming my favorite in Northwest Arkansas, chock-full of smart development led by smart, forward-thinking people, and without a doubt, the most diverse of any of her sister cities. Ah, Springdale. Licking my chops, I step up and place an order of the tortellini and tomato soup, and the Pittsburgh sandwich along with a Coke. Trust that I would have ordered a beer, but the restaurant at the time of publication had not yet acquired a beer and wine license; however, the owners have assured me that said license is coming soon. I perch myself atop a barstool at a thin counter at the front window, the perfect spot for looking out at Emma Avenue while watching the small dining room equipped with long, wooden communal tables. People are happy, chatting, laughing, enjoying a quick lunch in small clusters with friends and business associates – my mood continues to improve. Then a woman wearing an apron emerges from the kitchen carrying a large bowl of soup and a towering, stratified sandwich. The soup is delicious, not at all creamy, but pureed to a velvety, bright pool supporting several plump cheese bundles. I dive in face first, nearly inhaling the simple soup that simultaneously warms and coats me from tongue to belly, the experience propelled by the inclusion of the pillowy, soft tortellini. And yes, before lunch was concluded I accidentally anointed myself with a single, dime-sized crimson spot on the lapel of my blazer – a tomato memento of epic, delicious proportions. But the sandwich was nothing short of sublime — evolving my hangry attitude to happy — stacked over six inches high with griddle-fried salami, egg, melty provolone, hand-cut fries, pickled jalapenos, and vinegar slaw between toasted French bread. I take a deep breath, contemplating the difficult task at hand ­– eating it! I slowly extract the wooden skewer holding everything in place, then press down on the top, expecting to hear a loud accordion sound as I unhinge my jaw like a giant snake, close my eyes (for the second time) and squeeze as much of the Pittsburgh as I can into my mouth. Both elbows are on the bar as vinegar and juice race down my forearms, forming a small puddle as I bite, chew, swallow – then repeat. Without a doubt, this is one the best sandwiches I’ve ever eaten. The owners of Natural State Sandwiches, Tino (short for Celestino) and Amber Belasco, started their culinary journey in 2014 with the opening of a food truck in Fayetteville. After a couple years of harnessing success, they decided to expand their vision into a brick-and-mortar as part of the burgeoning cultural renaissance happening in downtown Springdale. The husband and wife duo work as a tight, compact well-oiled machine, with Tino manning the front of the house while Amber serves as executive chef, designing recipes and devising weekly menus. One of the great virtues of the eatery is the owners’ passion for promoting sustainable, local ingredients to ensure the freshest product; hence, the weekly specials bookended by only two sandwiches served on a regular basis – the aforementioned Pittsburgh Sandwich and the Chicken Salad, made with local apples, celery, fresh herbs, embellished with bacon bits, gargantuan onion rings and field greens on locally baked onion bun. On a recent week, the early spring menu was teeming with items such as the Chicken Berry Brie made with juicy oven-roasted chicken breast, sliced fresh strawberries, spiced pecans, creamy brie cheese, homemade onion rings, and organic balsamic salad on toasted local ciabatta; or perhaps the uber healthy Springtime Sandwich delicately constructed of roasted asparagus, pesto goat cheese, sautéed onions, peppery radish, a local farm egg, more onion rings for crunch and texture, and organic balsamic salad on toasted sourdough; and even incredibly delicious BBQ Sliders of local grass fed beef, cheese, sweet and spicy barbeque sauce on toasted King’s Hawaiian buns. Indeed, a little something for everyone. So, as much as I whine about the finicky early-spring climate of the High South, perhaps without it I might have missed an opportunity to engage in one of the greatest sandwiches of all time, the Pittsburgh at Natural State Sandwiches in downtown Springdale. There’s always a sunny side to everything, even in this complicated world where a drop in temperature, a wrong turn, or a long line can inexplicably turn HANGRY into HAPPY.